Shop our signed Jorge Lorenzo Moto GP memorabilia featuring autographed items from the Spanish rider. Signed Jorge Lorenzo shirts, caps & photographs. All with a Certificate of Authenticity, fast international shipping & free UK delivery, most with signing proof! Sixth on the all-time wins list, Spanish superbike racer Jorge Lorenzo is one of Moto GP’s most formidable forces. 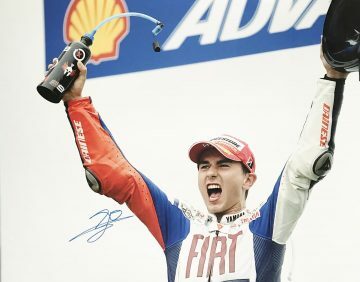 Despite his young age, he has a remarkable number of wins under his belt, becoming the first Spanish rider to win multiple premier class titles in 2012. The Circuito de Jerez (where the Spanish Grand Prix is held) named their thirteenth corner ‘Curva Lorenzo’ in tribute to the nation’s most successful Moto GP star. 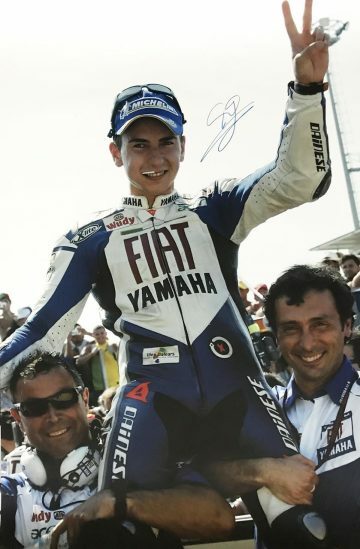 Lorenzo started riding at an early age and made his championship debut at the 125cc Spanish Grand Prix on his fifteenth birthday, missing the practice run as he was too young to race. Despite this, he dominated from the word go – winning nine pole positions and nine victories a few years later in 250cc class. This promising early talent was quickly recognised, and by 2008 he was confirmed as Valentino Rossi’s partner in Moto GP. This was a legendary (albeit competitive) partnership – and on his debut h,e clinched victory to secure his maiden win in the premier class. With that, he became the youngest rider to finish on the podium in three races. That first year was an interesting and testing one – as Lorenzo suffered multiple injuries. On one occasion despite chipping a bone and snapping a ligament in his ankle he still managed to finish in fourth place. In 2011 he lost the tip of his finger during a crash at Philip Island which was successfully reattached, nerves and all, via surgery in nearby Melbourne. This steely determination stood him in good stead for the rest of the season and ensuing competitions, and in 2010 he took home his first trophy as Moto GP World Champion. In total, Jorge Lorenzo has three Moto GP Championship wins to his name – the result of 47 wins and 114 podiums. He is well known for his crazy celebration antics post-win – but Lorenzo’s life is as colourful off the circuit as it is on it. He is known for his fiery, competitive personality – and has entertained fierce rivalries with fellow champion Valentino Rossi and Spaniard Dani Pedrosa. Our collection of Jorge Lorenzo signed Moto GP caps, shirts & photos has been carefully chosen for its authenticity and individuality. Browse and buy today.